Megillah reading & light refreshments. Joint event with Jewish Students at LSU. 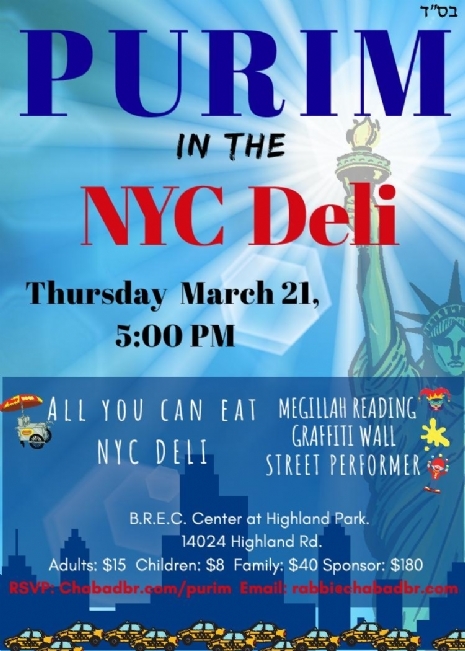 Purim in the NYC Deli, see flyer below. 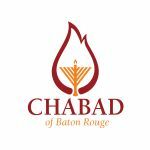 Please contact Chabad if you would like to schedule a megillah reading at your office, school, or other central location! 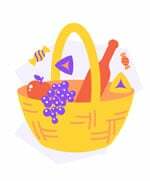 On Purim day, March 21, send a gift of at least two kinds of ready-to-eat foods (e.g., pastry, fruit, beverage) to at least one friend. It is preferable that the gifts be delivered via a third party. Children, in addition to sending their own gifts of food to their friends, make enthusiastic messengers. 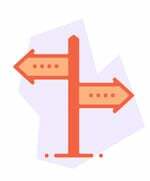 One of Purim’s primary themes is Jewish unity. Haman tried to kill us all, we were all in danger together, so we celebrate together too. Hence, on Purim day we place special emphasis on caring for the less fortunate. 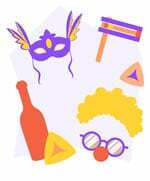 Give money or food to at least two needy people during the daylight hours of Purim, March 21st. 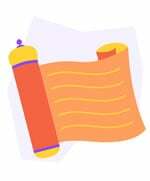 On Purim, we give a donation to whoever asks; we don’t verify his or her bank balance first. As with the other mitzvahs of Purim, even small children should fulfill this mitzvah. In everlasting memory of the founder of Chabad in Cyberspace, Rabbi Yosef Y. Kazen (father of Rabbi Peretz Kazen), pioneer of Torah, Judaism and Jewish information on the web.